This work is a performative exploration lasting several hours, in which the artist duo QUARTO, using a kilometrelong rope, challenges the notion of what a body is capable of. What is a thing, an object? How does it interact with a body, a subject? A rope, for instance, is one thing if we use it to tie something up or hold it together, and something entirely different if we use it as a whip. Thus, the object in itself does not exist, it is merely a function. In a five-hour performance, a 1000-metre rope is manipulated to generate a tension between body and rope through constant motion. The physical exertion, on the verge of the unbearable, gradually peels away our notions of body and object, ego and drama. 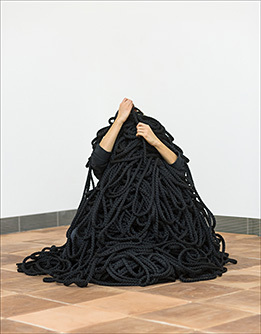 The performance takes place at Moderna Museet in Stockholm, in the exhibition Christodoulos Panayiotou: Days and Ages. Tickets: Entrance fee to the museum. Curator: Karin Malmquist. The artist duo Anna Mesquita and Leandro Zappala have created interdisciplinary art together since 2003, under the name of QUARTO. They live and work in the borderland between the two radically different cultures of Brazil and Sweden. Their performance works are open and unfinished. The encounter with the audience is essential, for it gives rise to resonances that lead to new events. Two trilogies have been produced by QUARTO since 2006. Each piece is independent but is also part of the whole. The performance work Beauty of Accident is the final part of the trilogy BEAUTY, which is now being developed into two new pieces: Durational Rope and Rope Installation. Artistic direction: Leandro Zappala. Choreography, concept & performance: Anna Mesquita & Leandro Zappala. Thanks to: Pille Repmakarn. Supported by: The Swedish Arts Council and The Swedish Arts Grants Committee.